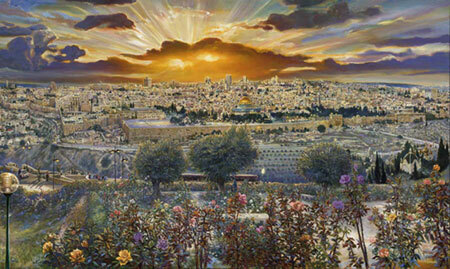 “Jerusalem Unveiling” by Ruth Mayer, www.ruthmayer.com/jerusalem.htm. A neighbor has a heart of gold. She takes into her home (not into private apartments, but regular bedrooms, and even the sofas when necessary) several people who would otherwise be in the streets. Some are emotionally disturbed, some are old, sick or feeble. For the past 20 years, they live there, eat there, do everything as if they owned the place, all while my friend caters to their every need, driving them to medical appointments, making sure they take their medications, etc. You might think that my neighbor is in the prime of her life with no worries of her own. Even then, her kind deeds would be outstanding. However, she is a senior citizen, she has several kids still at home, her husband is sick, and she has a blind, multiply-handicapped son who never recovered after suffering a brain aneurysm as a teen. And yet, she still takes care of all her “guests” as if they were her own children. With a smile, and a heart full of love. Reprinted from the book “From Kindness: Making a Difference in People’s Lives” by Zelig Pliskin, with the permission of Shaar Press. Your identity has a tremendous influence on your behavior. What we do readily or refuse to do is strongly connected with how we identify who we are. We tend to say, “I’ll do that. That’s who I am,” or, “I would never think of doing that, I’m not that kind of person.” This pattern can work for us or against us depending on the nature of our subjective identity. There was a famous study designed to illustrate the power of our sense of identity. “Can we place this large billboard with the words ‘DRIVE CAREFULLY’ on your front lawn?” a number of homeowners were asked. Unbeknown to them the question was posed by a student working on a research project. Understandably, most people answered, “No.” They didn’t want unsightly signs on their expensive front lawns. “Then would you please sign this petition for safe driving?” Most agreed to sign. “Yes. I haven’t changed my mind,” was the unanimous response. Most agreed. Why? Because once they identified themselves as individuals who cared about safe driving, they acted consistently with their new identity. Previously even if they agreed, they might have done so reluctantly. Now that they were acting in a way consistent with their identity as being concerned about safe driving, they felt good about doing their part to help save lives. This principle applies to all areas. On our subject, the principle can be stated: Identify yourself as a person who is kind and caring and you will spontaneously upgrade your level of kindness. There are many instances when you will have opportunities to do acts of kindness for others but might not be open to do them. At times you might not recognize the opportunity. At other times, you just won’t feel like doing the kind deed. Or you might not feel like it’s incumbent upon you to speak up. When you identify yourself as a person who loves kindness, you will notice opportunities you hadn’t noticed before. You will feel like doing acts of kindness you didn’t feel like doing before. And you will always feel that it’s up to you to do as much good as you can throughout your life. As you develop your love for kindness, you will view yourself as a person with a life goal to help others. You might not choose to share this with others. But in your heart you will know that this is who you are. Printed with permission of www.PartnersInKindness.org. Log in | Register |	88 queries. 0.553 seconds.